No vacation would be complete without an adventure, right? This time we decided to go snorkeling with a twist – we took a guided mini boat tour that left out of Puerto Chico Marina right around the corner from El Conquistador. 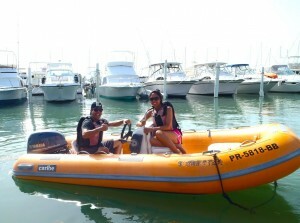 If you’re staying in Fajardo Kayaking Puerto Rico‘s Mini Bout tour is definitely worth checking out. Our guides Gilbert and Efrain were really cool dudes, knowledgeable about the area and funny to boot. This video was shot with my GoPro HD Hero and the photos that were mixed in were shot by our guides. Quick Tip: It’s an extra $15 bucks to get the photo package and it’s totally worth it.